Hello everyone, hope you had a good Mother's Day. While the following post will probably involve a lot of rambling, I just want to start off by saying that I appreciate all of you that follow me. Whether this is your first season here or your 8th, do know that I am glad you are here and am grateful that you stick with me as my style and process has changed over the years. Sometimes for the better, and sometimes for worse, but it's a process that never ends apparently. Let's do a quick freezer check and then we will get to the rambling. Upstairs freezer is housing stuff that you will see on the blog soon. Tasty Red Velvet Cake, more Perry's, and a young company called Yeti Frozen Custard. (usual selection of veggies and breakfast treats are in stock as well). Tempted to do a new review of Blue Bunny cookie dough because they have upgraded the swirl from super sweet to epic. Good times! 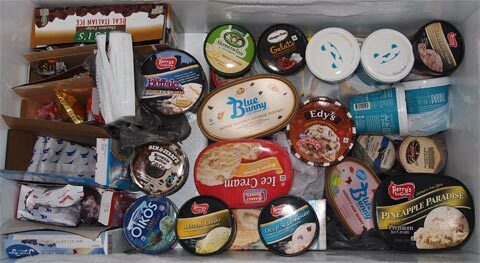 We've also got a bunch of Perry's to cover, more Yeti (duplicates), another Hippity Hop Berry because we ate the first one so quickly, some Graeters hiding out, and a pint of Oikos that has been there way too long. At some point I will get back to updating old reviews with new photos and thoughts. I don't do it a ton, but for example you will notice some old B&J reviews have updated notes at the start of them. You'll notice on the left that I've gotten lazy with finishing boxes of treats (I count six boxes but some of them have multiple products in them). I can't tell you how much this chest freezer has saved me in time and money and sanity over the years. It has earned it's keep a few times over. And now for the stats: 1500 product reviews. It's over 1500 products though because some of the reviews cover multiple products. 1205 of those reviews are mine, 295 are Nick's. You may have noticed he's been pretty quiet but that's because life has gotten very busy for him. I try to remind him that On Second Scoop is not his priority, I am not offended when other stuff comes first. Technically we could supplement some of his reviews with someone from the South or the West Coast, but I just don't know. I've had trouble committing to this idea. Ahhh, it might be a good time to start rambling. When I started this blog on May 8th, 2008, the internet was a very different place. Sure we had Facebook, but it was almost a year before Ashton Kutcher would be the first to hit a million followers on twitter (you now need almost 14 million followers to break in to the twitter top 100). It was also over two years before instagram was even an option and yet here I am, still muddling to get through it all. For someone who's been surfing the internet for over twenty years, today's internet is kind of scary. Don't get me wrong, I really do like instagram. It's struck a fun balance between blogging and tweeting and interacting that is no longer possible in a stand alone blog or on monetized Facebook. I just get a little worried for the future. My blog is permanent and forever and thorough. When you are on a social media platform, it's kind of just like renting a space for a moment (I had heard this described better than that but I think you get the idea). As the world evolves and information (and misinformation) spread faster and faster, it's tough being the old guy cataloging everything the old fashion way. So what's in store? I have no idea. I know posting every other day isn't the most exciting thing, but it's helped me keep the budget in check. I spent way too much money trying to be the first to try everything last year. The scary thing is that I've already hit most of what I wanted to for 2016. We went so crazy last year that I look back on the last few months and go "Ummm, is that it?" It just feels like something is missing but I don't know what. Ok, I really should get some sleep, but let me thank you one more time before I go. It's been a fun ride and I appreciate you sticking through the typos and bad days and the nonsensical way I think sometimes. I thought I would get more professional over the years but I'm not sure I have... or maybe I have but I don't know how to show it properly. I do wish my pictures were better. It's funny because I've really gotten in to the way things look and analyzing colors and patterns and everything, but I still have so much trouble taking a really good photo. Ugggg. And now I'm rambling. Good night! Be well! Keep scooping! And never be afraid to leave your thoughts and comments! South needs some representation. I recently tried Yeti, I liked the texture so I am excited to see your thoughts on some flavors. Yeti is from Austin south. I know OK also has Billy Goat (in my freezer untried), Braums, Blue Bell (not much OSS). We also have some Mexocan brands on shelves that I never see reviewed. Thanks for all the work you do maintaining this epic blog and the "work" you put in eating all that ice cream. No need to change the format unless it makes your life easier-it's comforting in it's familiarity the way it is. I'm in the demo age-wise, but I'm just not a fan of social media and the thirst for celebrity that it reeks of... so it is nice to be able to seek opinions on things i care about on a site like this. I love your blog and the Nosh Show podcasts. It's a lifeline to home in North America. I live in Japan, and the ice cream here's just not my style. Very limited flavour choices. Too much cheap stuff and not enough mix ins. 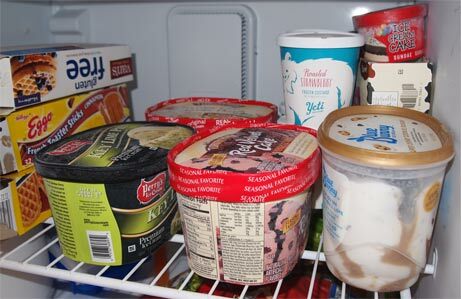 Real ice cream is super expensive or not carried in regular supermarkets. As you're driving around to 3 stores in a day, sifting through the clickbait for the treasures, and giving thorough reviews, please remember there are lots of fans who feast on the photos and text content because it's the closest thing to the real deal. I'm not here for perfect pictures, I'm here for your depth of knowledge about the products and companies, the enthusiasm, the experiments. And the rants. Rants are necessary at times. Thank you! @Anon: I think it would be cool to have a Mexican (and a Canadian) review now and then. I follow DQ Panama on twitter because they are often more experimental than US DQ. @Aaron: I should have called it "the ice cream archive". I like to think that me taking the time to update old reviews with name changes or discontinued status helps people when they can't track something down. @C: I do love ranting! I enjoy the blog the way it is, as well. More regional representation would be fantastic, though. It might also make a daily review feasible. I would also love it if you did reviews of older items that you have not yet reviewed. It would be great if you covered every available flavor of the big ice cream companies. @Anon: Is there anything in particular you are thinking of? Whether brand or flavor, I'm not sure what available products we haven't covered, but I am open to suggestions. Way cool. If you do decide you want a West Coast reviewer, hit me up. I'm always on the lookout for the new and experimental. I enjoy the reviews posted as it is really neat to see what's being made out there. Granted it's kinda difficult being in Indiana as we don't have that same span of different varieties that the NE has. I also like being able to see if a new to me ice cream has been reviewed before. I am sure many readers would volunteer to review. I would like to (personally try new flavors 2 times a week). But commitment is always a concern for bringing people on. That said, OSS is my favorite ice cream blog. TIC used to be good, but then he got married or dating or something??? new reviews always say ambiguous We and are super short. I almost think his guest reviewers keep "we" up now. Of course sorry. This post is meant to celebrate OSS, not insult others. There seem to be missing flavors in brands like Ben and Jerry's and Hagaan Dazs, and even store brands like Trader Joes or Sam's Choice, or Wegmans, etc. Before buying a flavor I look to see what you have said, and sometimes notice holes. ... Not that you have to try everything, but I like to know your opinion. I am curious to hear your opinion of Yeti frozen custard. I bought the lemon lavender when it was on sale at Whole Foods and quite liked it. The flavor was mild but pleasant and the texture was nice. Sprouts started carrying it recently and I have tried the vanilla, mint chip, roasted strawberry and blueberry pancake. The vanilla and mint are good. The strawberry is a bit too mild, and the blueberry pancake has no flavor. I couldn't get anyone ... Including toddlers ... To eat it. I'm not sure I would rush to buy any of them again. I think lemon is my favorite and mint chip second. @Sarah: I'm spoiled living where I do, something like 40 groceries stores between work and home. Hmmm. I tried the blueberry pancake a month or so ago. Maybe I just got a bad pint. I'm wiling to try it again if you had a different experience. I do like the texture. Thank you Dubba & Nick for sacrificing yourselves wading through the sea of crummy flavors/brands in search of good stuff to ensure that we don't have to. You are truly doing the Lord's work. I am on the East Coast for work this week, and just tried Wegman's organic dark chocolate raspberry. It is delicious! You should review some of their flavors. I really miss living near a Wegmans! Dubba, thanks for all the time and energy you have put into the blog. I don't think you need to change a thing. I'm not sure how you manage to take all of your pictures. Whenever I see ice cream in front of me, I don't ever think or have the patience to take a picture. I simply eat it. Your work is much appreciated. Also, thanks for taking pictures of the labels. I find them very helpful. This is a great site...content is much more important than flash! I wouldn't mind seeing some more reviews of store brands...stop and shop, trader joes, Shaws (stone ridge creamery) because they are often cheaper, and, especially now that some of the "better brands" (e.g., friendlys, breyers) have gone downhill, I'd like to know whether these are worth trying. Also, I don't know how complicated it would be, but might there be a way to link comparisons across brands and favors? For example, a comparison of the different chocolates you've tried? So that we can see them together? @Nocode: ha! this is why I don't take better pictures, no patience, I want to eat! Thanks! Haha, I guess I can't expect you to do all my "work" for me! But that won't stop be from making requests if I see something that has a big "fun factor" that I'd like you to try! I just saw healthy choice ice cream (or maybe it was Greek frozen yogurt) at BJs today. I think it was vanilla with a caramel swirl. I remember HC ice cream from about 15 years ago (if I recall correctly, the mint chocolate chip was awful but the brownie was pretty good) but thought it was gone (except for those chalky fudge bars)...maybe making a reappearance? I wouldn't request this as one you try but I just happened to notice it. By the way, do you finish your pints and other ice cream, or do you just review it and move on? And I just threw out 1/4 of Greater's Cheese Crown. So good, but melting and I am not close to home. I also ate all of the crown bites out! Muahahahaha. P.s. I have a strong disdain for social media; I come here for the texts and the rambles. It would be pretty boring if it was too "professional". Thanks and Thanks again!